Maybe you’ve already heard of him? An RSA Animate video The Power of Outrospection, already seen by over half a million. And now, having reviewed some of his impressive body of work on empathy and more, I’m a wholehearted fan as well. Q: So, who IS this guy? A: Well, with regard to the subject of empathy – understanding it, seeing the relevance of it, noticing the historical sweep of it, fostering it, and teaching it – Mr. Roman Krznaric (pronounced Kruz-Na-Ric) rules the turf. It makes no sense for me to reinvent this wheel. Instead I’m going to do two simple things here today. Summarize Krznaric’s six habits of highly empathic people and link it to the original article published in The Daily Good. Embed a 20 minute You Tube video of Roman giving this talk for those who prefer visuals. 1. Six Habits of Highly Empathic People – abbreviated. If this whet your appetite for the full article, click → The Six Habits of Highly Empathic People. 2. Six Habits of Highly Empathic People – the movie. This entry was posted in Compassion, Empathy, Relationship Skills and tagged "There's A Part of Me", Abolitionists, Adam Hochschild, Empathy, ending slavery, gay rights, Global Warming, Global Warming Campaigner, How Should We Live?, How To Find Fulfilling Work, Impact Anthropology, Marshal Rosenberg, Non-Violent Communication, Outrospection, Roman Krznaric, Six habits of Highly Empathic People, Teaching Empathy, The First Beautiful Game: Stories of Obsession in Real Tennis, The Greater Good, The Observer, the power of empathy, The Power of Outrospection, The Wonderbox: Curious Histories of How To Live, Vulnerability on June 10, 2015 by gemmautting. I so appreciate how much I learn every week, Gemma! Thanks for introducing my to this incredible man as well as empathetic strategies! Thank you again for your support Peggy Jo. I’m thinking of talking with Roman to see how to host a Human Library here in Boise. 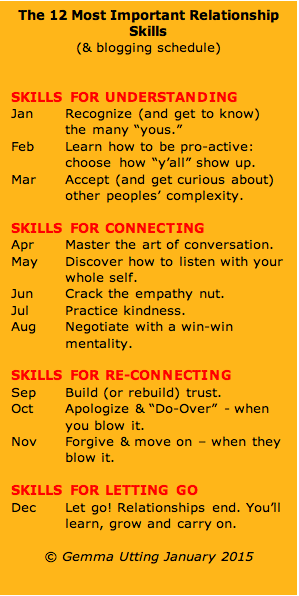 I think we’ve got all the ingredients to make our town ‘Empathy Town”… We need to talk!